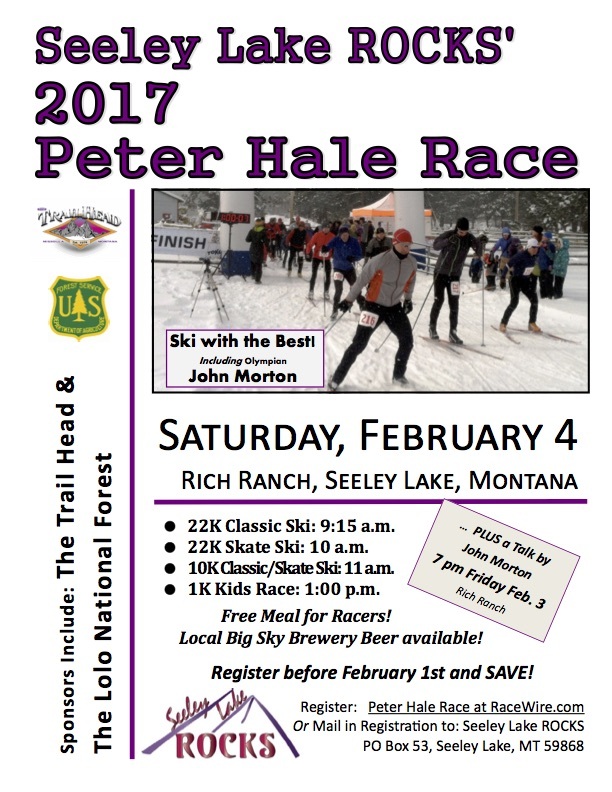 Seeley Lake ROCKS is pleased to announce that John Morton, former Olympic Nordic Skier, will participate in the Peter Hale Memorial Race to be held on Saturday, February 4, 2017, in Seeley Lake, MT. Morton is very familiar with Seeley’s ski trails. He knows the existing Seeley Creek Nordic Trails system well, and worked on the proposed Fawn Creek trail system that is bringing such excitement to the regional ski community. “We are looking forward to John’s participation in the race,” stated Noah Brautigam, Race Director. Morton’s involvement is expected to attract other notable skiers to the race, and the Seeley Lake Regional Outdoor Center for Kinetic Sports [ROCKS] is excited to expand the excellence and availability of the local Nordic experience. ROCKS is expanding the 2017 Peter Hale event by adding an inspiration talk given by Hall of Fame Olympic Biathlete John Morton. Morton will share his extensive knowledge and stores about Nordic skiing at the 7pm, Friday, Feb. 3rd event at the Rich Ranch. An Amazon book reviewer notes “John Morton is a great coach and story teller, and …[he] delivers on so many levels. Morty gives advice about physical preparation, equipment and mental preparation, all laced together with great stories and anecdotes. I still bring this book out to read the stories when I need a little motivation.” The event targets young skiers, but is open to all ages. The Peter Hale Race includes the traditional and challenging 22 km race, as well as a mellower 10 km race. Both races are open to classic and skate skiers. There will be a tent near the finish line with snacks, hot chili, and beer. The race day finishes with a 1 km fun race for children. Why is it called the “Peter Hale Race?” Peter was a dearly beloved figure in the American Nordic Ski community. He also has strong Seeley Lake connections. His passion for skiing and for young people was critical to the early development of the Seeley Lake Elementary Ski Program. Peter helped ROCKS with the initial challenge of outfitting the fourth grade class with skis, and introducing them to a wonderful life-time sport. The program has expanded to the entire elementary school, and is a daily reminder of one man’s involvement and legacy that continues today. Former Olympic skier John Morton regards Peter Hale as a good friend and is verbal with his recognition and high respect. “Skiing the Peter Hale Race is a fitting tribute,” say Morton as he looks forward to skiing in the namesake race to honor his late friend. John Morton has an amazing history as an Olympic skier, coach, trail designer, and author. He started skiing where he grew up in Walpole, NH. Initially he participated in four events (slalom, downhill, jumping, and cross country) at Tilton School in Tilton, NH. Later he skied at Middlebury College, and excelled in cross country skiing. “Morton was an outstanding collegiate skier for Middlebury College, sweeping all the Eastern Carnival races in 1966. He was named to the US Cross Country Ski Team in 1968, and the US Biathlon team in 1969. He remained on the US Biathlon team from 1969 through the 1976 season (with the exception of a tour of duty in Vietnam in 1971, earning the Bronze Star). In that span of time, he represented the US at the  Sapporo and  Innsbruck Olympics as an athlete. From 1976 through 2002 Morty served as an assistant coach and team Leader for the US Team, including at 5 more Olympic events.” [US Biathlon News] Morton was inducted into the US Biathlon Hall of Fame in 2009. “John has modeled the spirit of the Olympic movement for generations of athletes over his 30 years of involvement with the US Biathlon Team, and set a standard for humility, integrity, and success,” says Larry Pugh, the 2009 Chairman of United States Biathlon. In 1989, Morton initially focused on designing cross country ski trails. But, he soon found that fun, high quality trails were attractive to mountain bikers, runners, horseback riders, and others. His company, Morton Trails, has designed over 100 trails in the US, and around the world. These trail encourage healthy lifestyles, and increase surrounding property values. See details at MortonTrails.com. Morton became an international biathlon referee with the International Biathlon Union in 2004. He is also a certified course homologation inspector for the FIS (International Ski federation). Finally, Morton is an accomplished writer. He wrote “Don’t Look Back” (comprehensive guide to cross country skiing) in 1992, and a novel “Medal of Honor.” He is a frequent commentator on Vermont Public Radio, and has written over two-dozen magazine articles. In short, we are thrilled to have John Morton joining us for the Peter Hale event, and speaking at the 7pm, Friday, Feb. 3rd inspirational event. Complete details of the race and the Friday night are available at http://www.seeleylakenordic.org/PeterHaleMemorialRace.aspx [outdated link removed on 2018/01/15]. Seeley Lake Regional Outdoor Center for Kinetic Sports (ROCKS) is a 501c(3) non-profit located in Seeley Lake, MT, whose mission is to promote healthy children, strong families and vibrant communities through outdoor recreation. ROCKS working with regional organizations has been instrumental in equipping the Seeley Lake Elementary School students with skis, providing a warming hut at the Seeley Creek Trails and is currently developing a plan for a new Nordic ski area in Seeley Lake. MONDAY NOVEMBER 14th 3:45 PM Snow is predicted for West Yellowstone on Wednesday and Thursday of the week. We are hopeful that this storm brings what we need to groom the Plateau or Rendezvous trails in town. For Camp & Clinics Updates: We will be posting on this webpage daily as we know more about ski conditions. The Ski Festival Facebook page will also be updated with Ski Festival details and Weather Reports. STAY TUNED and join the Snow dance! Brenda Holland is the volunteer coordinator for the West Yellowstone Ski Festival races this year. They are holding races on Wednesday November 23rd (a Biathlon race), Friday November 25th, and Saturday November 26th. They are looking for volunteers and were wondering if some of our LCNSC members could either volunteer, or spread the word to any participants’ parents or friends or family members of racers who are going down to West Yellowstone for the races. Interested parties can can email Brenda at mailto:hollandbrendadh@aol.com, or call or text her at 406-539- 8889. Volunteers are fed as well as thanked. Brenda ended her email reminding everyone to pray for snow. The following is from the YSF website. This is a terrific opportunity to ski, learn, and get your cross-country legs revved up for what we all hope will be a banner year of nordic skiing. Go to their site to see about enrolling in classes, finding links to local hotels, and so forth. Sue and I always learn a bunch, and come back inspired by the young, up-and-coming, and the collegiate-level skiers who are zooming around the wonderful West Yellowstone trials. And we never feel like duffers, which is what we are I suppose, but there is a wonderful, buoyant spirit that carries us through the week with grins on our faces. From YSF website: For over 30 years, cross country skiers from across North America and around the world have traveled to West Yellowstone, Montana’s Yellowstone Ski Festival to begin their Nordic ski season on the Rendezvous Ski Trails. The Yellowstone Ski Festival takes place during Thanksgiving week. The event’s highlights include a series of Nordic skiing clinics, competitive races, Biathlon races, the On Snow Gear Demo, an Indoor Ski Show, and a variety of presentations, clinics, and classes.